omid (mashhad, Iran) on 13 January 2016 in Miscellaneous and Portfolio. This makes even my windows look cared-for ! What character it carries. Un très beau plan rapproché sur le thème du temps qui passe! J'aime beaucoup cette vieille fenêtre un peu délabrée mais qui a de jolis rideaux qui protègent des regards curieux des passants. Ah oui, il doit y avoir des courants d'air ! jolie prise ! Great find! I like the subject, the colors and the different textures. So many would have gazed out from inside..
and so many would have convered from outside with some from inside ! Nice to see but not so nice to use. This is no longer just a painting iron. filled with old-time charm and warmth ... great compo with much to discover ! Beautiful old textures and colors ! superb mood ! Wonderful colors and details.... and so old! This window makes a great visual! Beautiful - I really like how the curtains are different in each pane. A well-framed view of this window!! I love the patterns between the mullions and the weathered look of the wood. Really great! 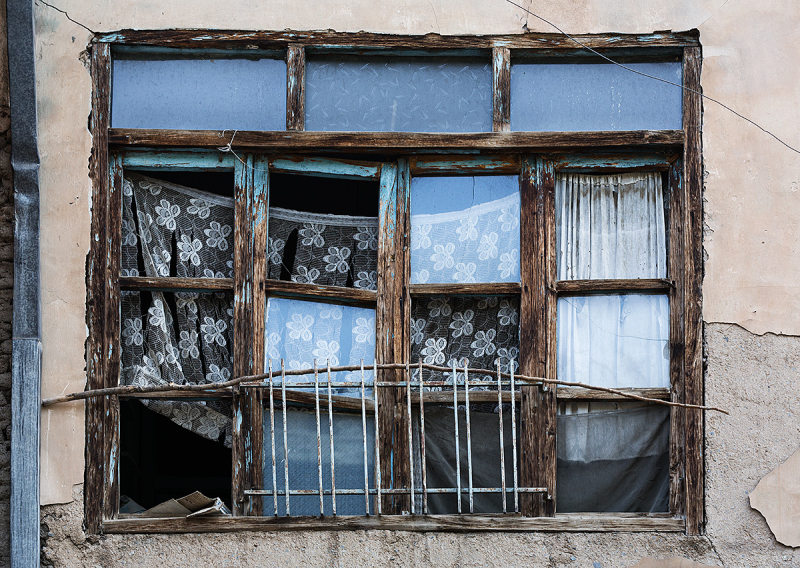 I love the makeshift ways of repairing old things like this window! A beautiful find! Would not keep out much rain. Très belles textures et couleurs ! Such a superb shot of this old window. It speaks of hard times and determination. That is gorgeous aging beauty. Very nice shot. Lovely old window with beautiful curtains. This is beautiful. A great find! Genial captura, colores y luz. ***** Saludos. Good ! i like the curtains too.